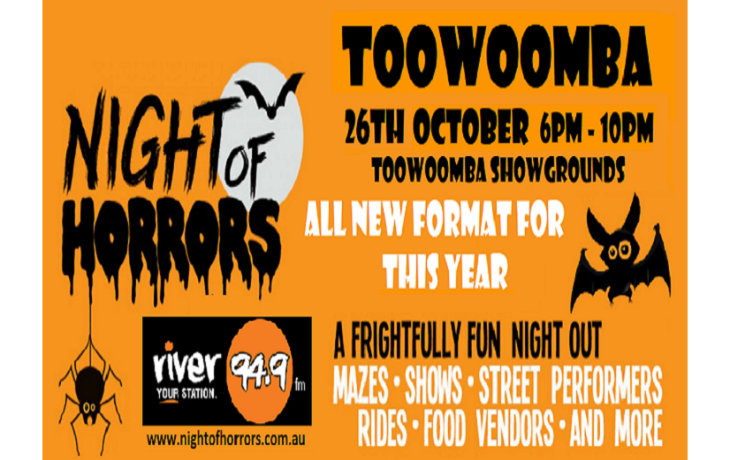 Our River 949 FM Toowoomba Night of Horrors will be the best one yet. With a whole new format, there will be less queues, no ride bands, no tokens, no fast track. All Mazes, carnival rides and entertainment will be included as UNLIMITED - ALL NIGHT for one fantastic, all inclusive Pre-paid entry fee of $40, SAVE $10 on the normal entry of $50 on the night!! Food and beverages are not included in ticket purchase, but will be available at the event. No outside food to be brought into the event. You MUST present your ticket/s at the gate (Either printed or on mobile device) Gates will open at 5:15pm. But - be warned - there are limited tickets - if they sell out before the night, there will be no more tickets sold! General Admission Ticket - Toowoomba Night of Horrors - Evening Session.